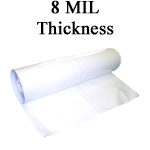 6, 7, 8, 8.5, 9, 10 and 12 Mil thick shrink wrap options. A "mil" is 1/1000th of an inch. A 7 mil thick roll of shrink wrap is 7/1000th of an inch thick, which is a.k.a. 178 microns. With so many mils of shrink wrap to select, you can be sure to find the right thickness to suit your job. 6 mil / 153 microns: Great for boats, RVs, patio furniture & small storage projects. 7 mil / 178 microns: Great for boats, RVs, patio furniture & small storage projects. & protection. Ideal for disaster restoration projects. 10 mil / 254 microns: Construction, scaffolding, modular home construction and restoration projects. 12 mil / 305 microns: The heaviest of shrink wraps - suited to completely protect any industrial, marine, construction or renovation project you encounter. 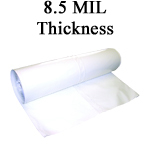 Every Shrink Wrap project can require a different Shrink Wrap Thickness so choose the thickness you need.